"It is futile to wait just for leaders to improve society. All of history's great changes - nonviolent changes - came from below, not from above. It comes from us, and often from the least of us." Sarge understood and deeply supported the civil rights movement of the 1950s and 1960s, because he recognized that the secondary status of the African American community was inherently unjust. He therefore championed the movement from the very beginning of his career in public service, because as he stated above, he knew that the driving force for change would come from the people, not their leaders. In the 1950s, as head of the Chicago Board of Education and the Catholic Interracial Council, Sarge led the successful fight to integrate the city's public and parochial schools. In 1960, when Martin Luther King was arrested in Georgia and sentenced to four months of hard labor for a traffic violation, Sarge urged presidential candidate John Kennedy to publicly offer his support for King, and to call his wife, Coretta Scott King, to make his personal commitment to freeing the civil rights leader. Although many Kennedy supporters howled that such an action would lead to the loss of Southern votes, Sarge successfully persuaded then-senator Kennedy. He made the call, and Sarge leaked the story to the news media. The expression of support led to Dr. King's release, and to a huge swing of African American votes to Kennedy's camp. 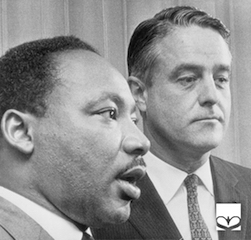 You can learn more about the freeing of Dr. King in this clip from the documentary "American Idealist: The Story of Sargent Shriver". Sarge believed the cause of civil rights was inextricably connected to economic status - that freedom without economic opportunity was still second-class citizenship. After President Kennedy's assassination, President Lyndon Johnson named Sarge the head of the Office of Economic Opportunity, which was the official office of the War on Poverty. In this capacity, Sarge created programs that empowered millions of poor Americans, many of whom were African Americans. He was also a strong advocate for the Civil Rights Act of 1964 and the Voting Rights Act of 1965. Sarge understood that an America that segregated its citizens along any lines - social, racial, economic, justice - was not truly democratic. His gift was in inspiring others to see their role in effecting change. For example, he created the structure for Legal Services for those too poor to afford an attorney, or who were denied those services because of the color of their skin. He also approached the cause from the opposite end, spending countless hours talking to individual lawyers and to legal organizations, pushing them to participate, to do more, to take responsibility for the justice system in which they worked. Sarge's deep, sincere belief in the equality of all men and women rested on the same spiritual bedrock as that of Dr. King. For that reason, the fight for civil rights held a central place in his heart.